A battle of two horses, that’s the way in which 2014 Formula 1 season could be described, but none of those two horses was Ferrari’s. Mercedes drivers Lewis Hamilton and Nico Rosberg were superior, winning 16 out of 19 races. 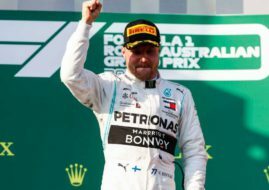 At the end of the season, British driver had a reason for celebration because he won the championship clinching his second title, while Rosberg won inaugural FIA Pole Trophy with 11 pole positions. For the first time, Mercedes won Constructors’ championship by a margin of almost 300 points more than second placed Red Bull-Renault. Williams-Mercedes clinched the last place on the podium. 65th season of Formula 1 had 19 races after Korea, Mexico and America were removed from the final calendar. For the first time, Russian Grand Prix was held, at Sochi Autodrom and Austrian Grand Prix at Red Bull Ring was revived after 11 years. Opening of the 2014 Formula 1 season was far from perfect for Hamilton who had to retire in Australian GP. Rosberg won the race at Victoria Park but his teammate had his revenge, winning next four races at Malaysia, Bahrain, China and Spain. Everything went well for Hamilton, but he didn’t win any of the next three races. Rosberg was the fastest in Monaco and in Austria, but Red Bull’s Daniel Ricciardo claimed his maiden F1 victory in Canada. Rosberg was triumphant in Austria, but Hamilton kicked back at home soil. In the middle of the season, Hamilton’s form wasn’t best and he again failed to win three races in row. He took two third places in Germany and Hungary, while in Belgium he had to retire. Rosberg won at Hockenheimring and Ricciardo claimed two first places at Hungaroring and Spa. The decisive part of the season came from the race in Italy. Hamilton won at Monza and then clinched four more victories in Singapore, Japan, Russia and USA. In four of this five races Rosberg was second so he was still in charge two races before the end of the season. 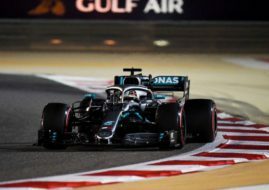 German won in Brazil beating Hamilton, so the last race of the season in Abu Dhabi was decisive. Rosberg won pole position, but Hamilton owned the race from the start and went first through finish line, leaving Rosberg disappointed at 14th place. Other drivers and teams were overshadowed by Mercedes’ power in 2014 Formula 1 season, but many of them could be happy with their performances. Third place for Williams was a great success after a few disappointing seasons, while Ferrari was awful, claiming just two podiums. Ricciardo showed some nice skills by breaking Mercedes’ superiority three times and leaving his teammate and defending champion Sebastian Vettel well behind. Six podiums for Williams Valtteri Bottas were also respectable, while Daniil Kvyat showed potential in his rookie season for Toro Rosso, as well as Kevin Magnusen in McLaren. The worst moment of 2014 Formula 1 season was a crash in Japanese GP where Jules Bianchi suffered a serious head injury forcing him out of the season and probably for a longer time.